Most pregnancies last approximately 40 weeks. Babies born between 37 and 42 weeks of gestation are considered full term. Babies that are born before 37 weeks gestation are defined as premature. As many as 11.4 percent of all pregnancies end in early deliveries. About 450,000 babies in the United States alone are born too soon and 15 million babies are born preterm around the world - that's 1 in 10! 80 plus percent of preterm births are unanticipated. 15-20% are attributed to medically indicated (example: preeclampsia, abruption, IUGR) or elective preterm deliveries. The premature birth rate in the United States has dropped for the seventh consecutive year, to 11.4 percent of all births in 2013. This is the lowest rate in 17 years! The federal government's goal had been to reduce preterm births from a baseline of 12.7 percent in 2007 to 11.4 percent by 2020. The new figures mean the country hit the target seven years early. Medical expenses for a baby born prematurely average about $54,000, compared with $4,000 for a healthy, full-term newborn. More than 70 percent of premature babies are born between 34 and 36 weeks gestation. 12 percent of premature babies are born between 32 and 33 weeks gestation. 10 percent of premature babies are born between 28 and 32 weeks gestation. 6 percent of premature babies are born before 28 weeks gestation. Babies born 23 weeks have a 17 percent chance of survival. Babies born at 24 weeks have a 39 percent chance of survival. 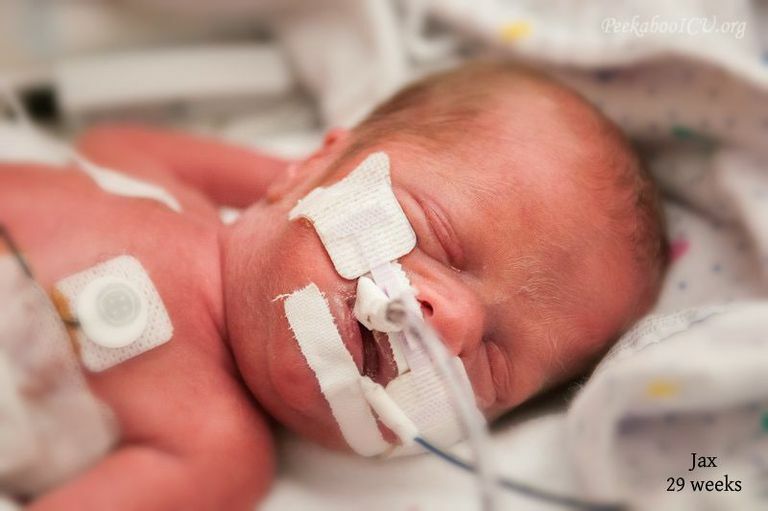 Babies born at 25 weeks have a 50 percent chance of survival. Babies born at 26 weeks have an 80 percent chance of survival. Babies born at 27 weeks have a 90 percent chance of survival. Babies born between 28-31 weeks gestation have at 90-95 percent chance of survival. Babies born between 32-33 weeks have a 95 percent chance of survival. Most babies born 34 weeks or greater have the same likelihood of survival as a full term infant. The odds of survival increase as the pregnancy progresses. With every week a baby remains in the womb the chance for thriving and surviving increases. However, gestational age isn’t the only determining factor for survival for babies born too early. Multiple factors play an important role in how well a baby will do including birth weight, complications of pregnancy such as placental abruption, infection, and immature lung development to name just a few. Fortunately, medical research and advances have increased the chances of survival in even the tiniest of babies. 20% of all those born at 26 weeks gestation or earlier will have no long term effects from their prematurity. The American Congress of Obstetricians and Gynecologists (ACOG) and the Society for Maternal-Fetal Medicine (SMFM) recently announced that they are recommending the use of the label "term" in pregnancy be replaced by new gestational age designations. According to the new designations, full term will refer to 39 weeks through 40 weeks and 6 days of pregnancy. In the past, a pregnancy between 37 and 42 weeks was considered full term. Mothers who deliver at or after 39 weeks of pregnancy typically have better outcomes than do mothers who deliver before 39 weeks. Napoleon Bonaparte: born in 1769 was one of the greatest military leaders in history. His small statue is noted to be the result of his premature birth. Mark Twain: An accomplished American writer born in 1835, born 2 months premature. Sidney Poitier: Award winning actor, film director, and activist. Winston Churchill: A British politician and statesman, born 2 months premature in 1874. Albert Einstein: Born premature in Germany in March of 1879. Einstein experienced small beginnings in a time where neonatology was virtually nonexistent and went on to make outstanding achievements in math and science. Anna Pavlova: Born 2 months premature in 1881 and grew up to become one of the world’s most famous ballerinas. Patrick Bouvier Kennedy: The 3rd child of Jacqueline and John F. Kennedy was born at 34 weeks and died at 2 days of age due to Hyaline Membrane Disease, also known as Respiratory Distress Syndrome or RDS. RDS is one of the most common complications of prematurity. The loss of the first family’s baby deeply moved the nation and led to an outpouring of public and private resources for medical research leading to use of surfactant therapy in babies born with immature lungs. Isaac Newton: Scientist and inventor who described the laws of gravity. Born in 1643, small enough to fit into a quart mug, according to his mother. Charles Darwin: An English naturalist and scientist- the originator of the biological theory of evolution. Pablo Picasso: Artist and Spanish painter- famous sculptor, printmaker, ceramicist. Michael J. Fox: Canadian-born actor, author, producer, and activist. Wayne Brady: American actor, singer, comedian and television personality; born 3 months premature. Phillip Phillips: Musician and winner of American Idol 2012. Born premature in 1990 and almost didn’t make it. He has struggled with digestive issues and is said to be a NEC survivor. Rumaisa Rahman, born at 25 weeks gestation in September of 2004 in a Chicago area hospital is thought to hold the current record as the World’s smallest surviving baby, weighing 244 grams or 8.6 ounces. James Elgin Gill, born in May 1987 in Ottawa Canada was the earliest premature baby in the world. He was 128 days premature at 21 weeks and 5 days gestation. James weighed 644g or 1lb 6oz. He survived and is reported to be healthy in his mid-20s. Premature Birth Report Card 2016. March of Dimes. (n.d.). PeriStats | March of Dimes. (n.d.). Premature Birth Statistics | Statistic Brain. (n.d.). Prematurity at Birth: Determinants, Consequences, and Geographic Variation - Preterm Birth - NCBI Bookshelf. (n.d.). Preterm Birth as a Public Health Initiative (n.d.). Products - Data Briefs - Number 39 - May 2010. (n.d.). Statistics about Premature Birth - RightDiagnosis.com. (n.d.). WHO | Preterm Birth. (n.d.). What Level Nursery Care Does Your Preemie Need?